Well, this shold be an exciting weekend - Darcy is getting baptized. While that alone is a big deal, I'm also really excited that we will be seeing a whole bunch of friends and family. We are trying to keep it low key, so I plan on just doing some mini sandwiches and a couple salads. I'm definitely doing this Toasted Hazelnut and Shredded Carrot Salad and I'm thinking I might do my old favorite, Asparagus Pasta Salad. Maybe some White Bean Dip, too. We'll see. I included a recent picture of Darcy at the end of this post, so you can see how much bigger she is these days! Bridget at Decisive Moment Photojournalism is not happy with Rachael Ray's recipe for Sausage and Spinach Stuffed Mushrooms. Rachael Ray's magazine is still bucking the downward trend. Nancy Leson of All You Can Eat has details on Rachael's recent visit to a Seattle area restaurant. Grub Street lets us know who will be competiting in this year's Burger Bash at the South Beach Wine and Food Festival, which will be hosted by Rachael Ray. 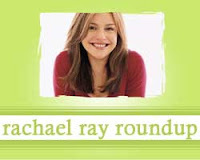 Becky Sher of the Centre Daily Times grudgingly admits that Rachael Ray's Yum-O! The Family Cookbook is a pretty good cookbook. Broadcasting and Cable informs us that Rachael's talk show ratings were down six percent. Rachael's new Booscotti was a hit in at least one household. And for a little Friday fun, here's Darcy! 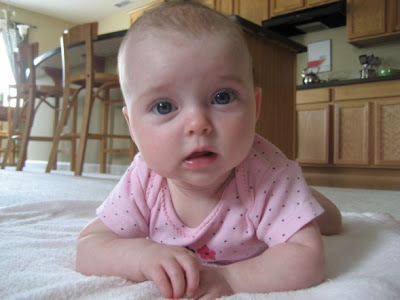 She is just darling, thanks for sharing the photo. Thank you! I just want to squish her all the time. She's a sweetheart and sleeping like a champ these days!